You bake a lot of flavors, I heard about 40, is that correct? Yes, we actually have more flavors. I have lost count. Popular flavors, such as turtle and rocky road, are baked more often than others. How many flavors do you offer daily? From six to twelve flavors. Sometimes a few more. What is your best-selling flavor or flavor combo? Red velvet with cream cheese frosting. 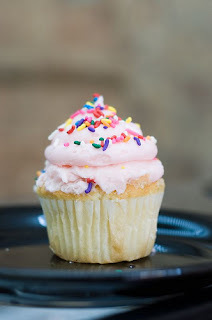 During this summer, we have been selling white cake with strawberry filling and strawberry buttercream frosting! I always taste new recipes. I usually end up eating the cupcakes without frosting. They are just the right size and you can eat just the frosting first or cake and frosting together! Filled cupcakes and angel food cupcakes. I like the individual size of the cupcakes.They are so cute! Perfect to have at events and serve a variety so guests can choose. Problem is they want to try all the flavors! Can't think of anything. Sometimes I say I wish they could bake faster. Yes I bake my own every morning and my husband is my assistant baker. We are in the kitchen together in the mornings baking. Would love to have a baker. I personally like to frost better than baking them. It's like art. My mom always made cupcakes in an ice cream cone and I would take them to school. Kids thought that was the greatest! Cupcakes don't look the same now as what they did back then. Not sure I can say in this interview, ha ha! Cupcakes are fun! 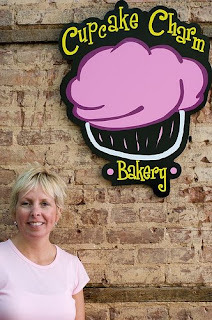 I love to hear customers come in and say "I don't know whether to take a picture of the cupcakes or eat them!" It's also interesting to hear everybody's favorite cupcake. We also do birthday parties. I take kids (adults too -- I did a 20-year-old's party back in April) back in the kitchen and we make frosting and then we set up the tables for them to decorate their cupcake. The cost is $5.00 per child. I have also hosted bridal and baby showers in the store. We set a $50.00 minimum order to reserve a party. Notes from the interviewer: Cindy is, by her own admission, not very Web-savvy, and is relying on her kids' help to get a website and possible blog or Facebook account. We all know how important it is to have info, pictures, prices, etc., readily available for prospective clients. CTTC hopes that Cindy is able to get that assistance she needs. Go Geek! 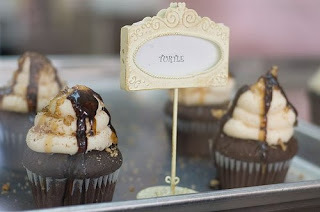 All images shot by our Atlanta-area cupcake fan, Brian Wible for Cupcakes Take the Cake. You can see more delicious cupcake shots by Brian here. Thanks for this interview! I live near here and can't wait to try it out! !